Today’s recipe is slightly different than the usual. I know that tuna salad is not elaborate or special or even unique…but it is normal! And this is, after all, NORMAL cooking. 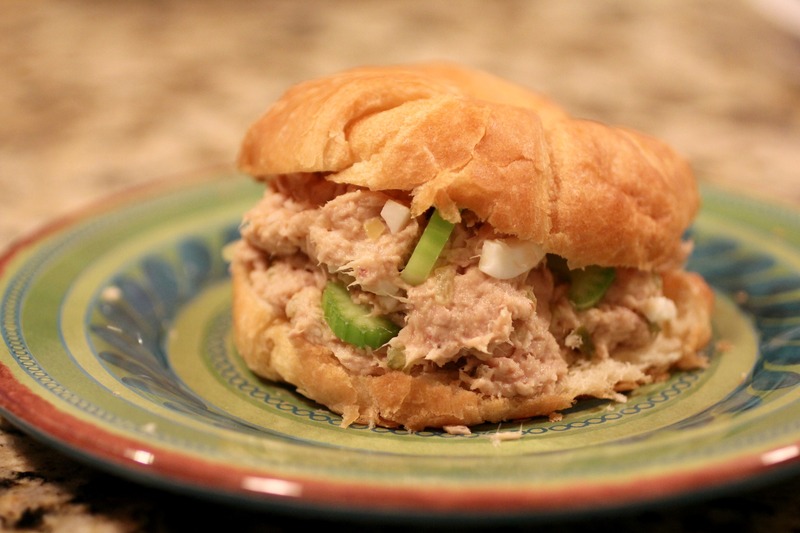 Tuna salad is a quick and easy meal to whip up. So quick and easy, in fact, that there is no cooking involved. Ok so I know the blog is called normal COOKING, but go with me here. I don’t know about you, but I LOVE tuna salad. It’s great as a sandwich, on cracker, or just by itself. To me, it’s addicting…I always eat several servings of the stuff. There are TONS of different ways to prepare tuna salad. 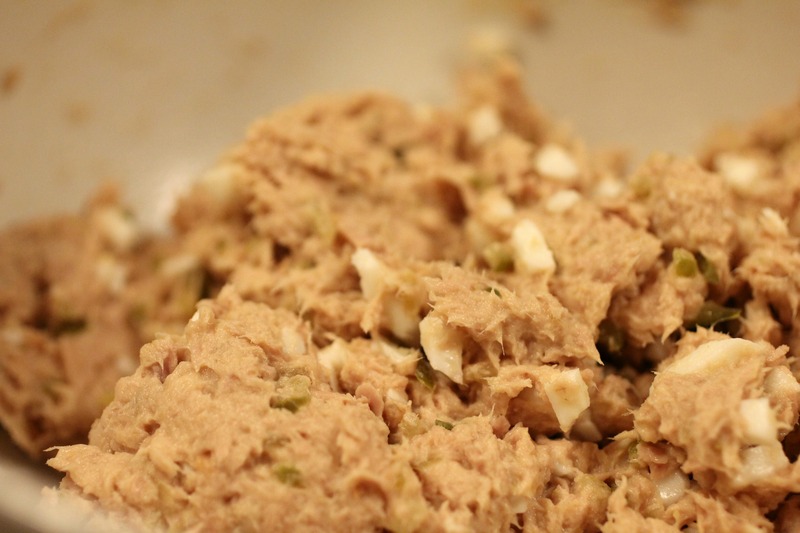 Seriously, google “tuna salad recipe,” and you’ll get hundreds of different variations. I’m going to be sharing with you my personal favorite version. It’s the same way my mom always made it. The thing is, that this is like the one and only thing I make that doesn’t have an actual recipe. It’s just one of those taste-and-see kinda things. I do have one tip for you. When you’re boiling eggs, whether it’s for tuna salad, deviled eggs, or whatever it may be, add 1 teaspoon of baking soda to the water. It will make the shells SSSSOOOO much easier to peel off! I tried it yesterday, and it was miraculous! Empty tuna into a large bowl. Add mayo. The purpose of the mayo is to get the salad to the perfect consistency. So I'd start with a half cup and add more as needed if it's too dry. Add sweet salad cubes. Again, start with a half cup and then taste test. If it's kind of bland, continue adding more until you're satisfied with the flavor. Add diced eggs. This gives some variety of flavor and texture. 4 is the number of eggs I like to use, but it's up to you! Add any optional ingredients. Mix together well and refrigerate for at least half an hour. Serve on a croissant roll, loaf bread, crackers, or just eat it plain! What are sweet salad cubes? I’ve never heard of them before! They’re like pickles It’s pretty much the same thing as relish, but a chunkier texture Some people use relish instead, but I think it makes the salad a bit too mushy. Ohhh, that’s what I thought but I wasn’t sure. I love pickles so I’m sure I would like them. I’ll have to look for them here, I’ve never seen or heard of them before. Ya know, that is a great pre-test ritual! I would sometimes eat chocolate when I studied and then eat chocolate during a test The sense of smell triggers memories so it helps you remember what you studied. Isn’t that funny! I’m going to try that this week while i’m prepping for my midterms. Thanks for the tip! Since I am not a cook, I need measurements Do you have? Hey Diana! Trust me, I totally know where you’re coming from I am the world’s worst at eyeballing measurements, and I’m a perfectionist who wants everything to be exact With this recipe though, you really can’t go wrong! Don’t worry about getting it exact! I would say start with about 1/2 c of mayo and 1/2 c of salad cubes That will probably not be quite enough to get the smooth texture you want, but you can add more afterwards. Hope that helps! I have never heard of salad cubes either, but I think you could probably just use chopped up sweet pickles instead. Terri, chopped sweet pickles would work just fine! Or if you have any relish, you could just use that.